HÀ NỘI - Việt Nam National Shipping Lines (Vinalines) will make an initial public offering (IPO) in December this year, acting general director Nguyễn Cảnh Tĩnh said. Tĩnh said the corporation’s IPO plan was approved by the Prime Minister early this year, according to which the State will hold 65 per cent of VNĐ12.3 trillion – registered capital of parent company Vinalines. “The parent company will sell 35 per cent. In which, strategic investors will have the opportunity to own a half, while the remainder will be sold out publicly,” Tĩnh said. Under the plan, Vinalines is also allowed to hold 65 per cent of registered capital at key ports, including Hải Phòng, Sài Gòn and Đà Nẵng. Vinalines currently manages a fleet of off-shore vessels with total capacity of nearly two million tonnes, occupying some 25 per cent of the national fleet’s capacity. The corporation has contributed capital to 14 sea port businesses, which have a total length of more than 13,000m -- 30 per cent of the total length of ports nationwide. They include a number of international entrepot ports and deep-water harbours that can receive 190,000 tonne vessels. In addition, Vinalines has also contributed capital to 10 maritime service enterprises, which have a total of more than 2.6 million sq.m area of storage and warehouse facilities across the country. From now to 2020, Vinalines will focus on developing and exploiting sea ports, which play strategic and important roles in the northern, central and southern areas of the country and are the lifeline of the national transportation network. 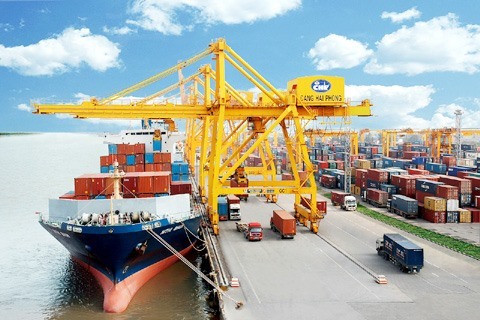 According to Tĩnh Vinalines has currently prioritised investment in deep-water harbour and international entrepot port projects, including Hải Phòng Port with two container terminals, which can receive ships with a capacity of 8,000 TEU (twenty-foot equivalent units), and Liên Chiểu port, which can receive ships with a capacity of 100,000 tonnes. Meanwhile, the corporation will focus on completing and putting into operation the first phase of the Sài Gòn-Hiệp Phước Port and investing in the port’s second phase. It will also raise the efficiency of joint-venture ports in Cái Mép-Thị Vải in the southern province of Bà Rịa-Vũng Tàu and other ports, including Vinalines Hậu Giang, Cần Thơ and Cam Ranh. As for sea transport, Vinalines expects that its vessel fleet’s capacity will reach 1.85 million tonnes by 2020, with the average age of a ship being 10-12 years, of which 17 per cent will be container carriers, 26 per cent crude carriers and 57 per cent dry cargo carriers. The corporation has made logistics service a key development area. It will focus on completing and putting in use infrastructure of sea ports, goods distribution centres, logistic centres and inland container depots from the north to the south. In 2016, although sea transportation continued to face difficulties, it still witnessed strong growth and profit from sea ports and logistics. Sea ports’ operation earned pre-tax profit of more than VNĐ920 billion last year, a year-on-year increase of nearly 60 per cent. All ports were reported to have grown following equitisation. Hải Phòng Port made a profit of more than VNĐ670 billion in 2016, VNĐ70 billion higher than that in 2015 when it was not equitised. Meanwhile, Đà Nẵng Port reached a profit of more than VNĐ150 billion last year, some VNĐ100 billion higher than that of 2015. Joint venture ports such as Cái Mép International Terminal, Cái Lân International Container Terminal and SP-SSA International Terminal also witnessed growth in output and revenue. “With satisfactory results after four years of restructuring as well as efforts to maintain the high volume of State-owned capital at the corporation, the position and value of Vinalines will change, opening new opportunities for a business when it converts operations into a public company model,” Tĩnh said.